As I'm sure most people know, Germanium transistors were the first ones to be used in Fuzz pedals. I'm always fascinated by the idea of "Mojo" - that special undefinable quality. So I've been playing with PNP Germanium transistors on breadboard for a couple of months. This holiday I had some time to draw up some proper layouts. 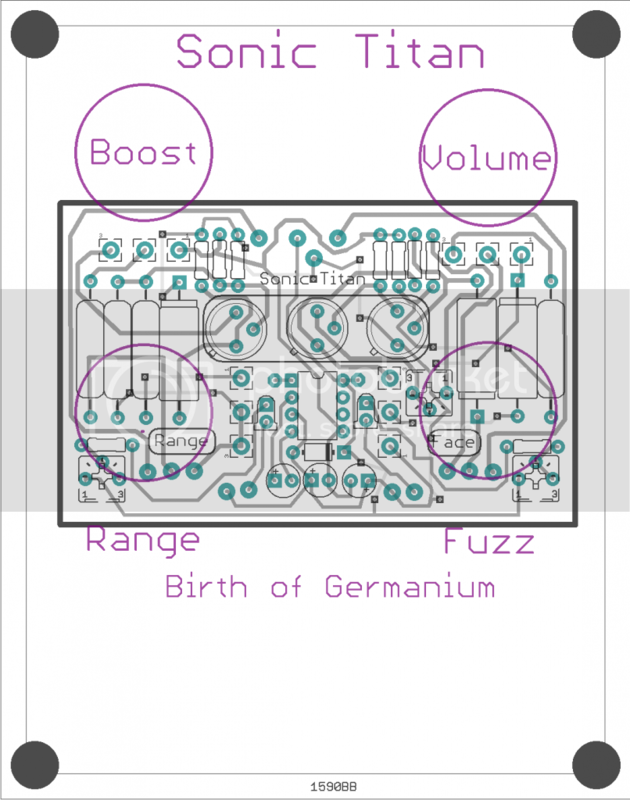 The first one "Germanium Birth" is a stock standard Germanium PNP Fuzz Face and Rangemaster Treble boost. 1. Used a bipolar charge pump so it can be powered by a normal power adapter. 2. Added a "Range" knob to go from Treble to full range boost. The objective was to get an accurate reproduction of that "first" mojo filled sound. To ensure the Mojo, the layout is designed for those old fashioned axial capacitors. 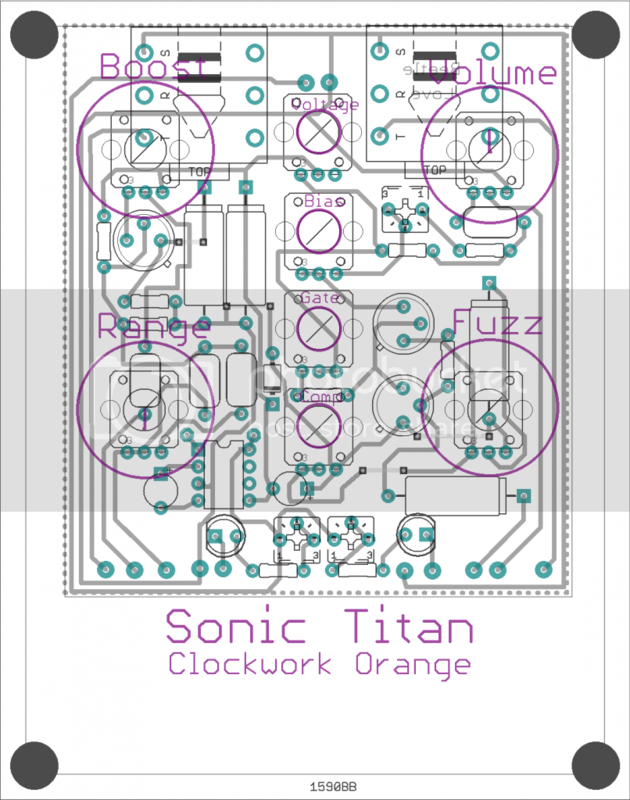 The second one "Clockwork Orange" has the same "Germanium Birth" foundation but it has a number of different mods that make the circuit a lot more interesting and useable. I'm still playing around with it on breadboard but here's the preliminary layout. I'll be building both over the next week. Further details and information to follow. I'll have a spare board or two if anyone wants one. 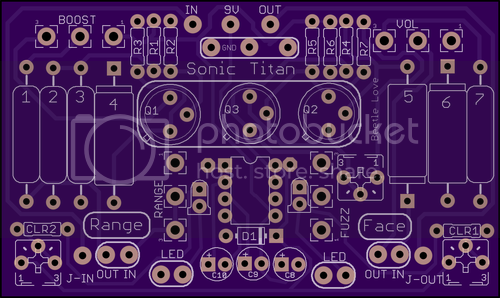 Having the PCB is one thing... Having the Germanium transistors is a whole different thing. Why the use of a charge pump? You can use a standard Bosstype power supply (Battery sounds best with fuzz) Just do the circuit "upside down"
Mojo? with the caps maybe, but the Germs sound great for a reason. The low HFE mixed with a bit of current leakage, make them great for fuzzface type circuits, and clean up so well when guitar volume is backed off. No mojo with them, just fact. Did you find a special mix of hfe's for your fuzzface? Here the charge pump is acting as a voltage inverter to give a "-9v" to the circuits. I thought it would be worthwhile in case you need to daisy chain other effects. Any reason batteries would be better for fuzz? Is it just the lower voltage? Or something complex and above my paygrade? That's one of the mods on the next version - a voltage starve control. Works wonderfully on breadboard. I remember reading somewhere that according to Mr ZVex, the starve pot pretty much does a spot on simulation of a battery due to the additional series resistance being characteristic of depleting batteries. The "Stab" on the Fuzz Factory does just that - adds a 5k pot in series. The previous "Fuzz Faceless" I used the pot as a voltage divider rather than series to shake things up. But that's definitely just splitting hairs! As to the HFE's, I haven't measured or experimented properly with different gains. The AC128's I have do have the HFE's written down but I want to measure them myself when I have time. That was also one of features I was considering for the next version - a 3pdt/4pdt to switch between 2 transistors and respective bias trimmers. Just switch the second transistor? Would 2 germaniums sound significantly different to justify a switch? 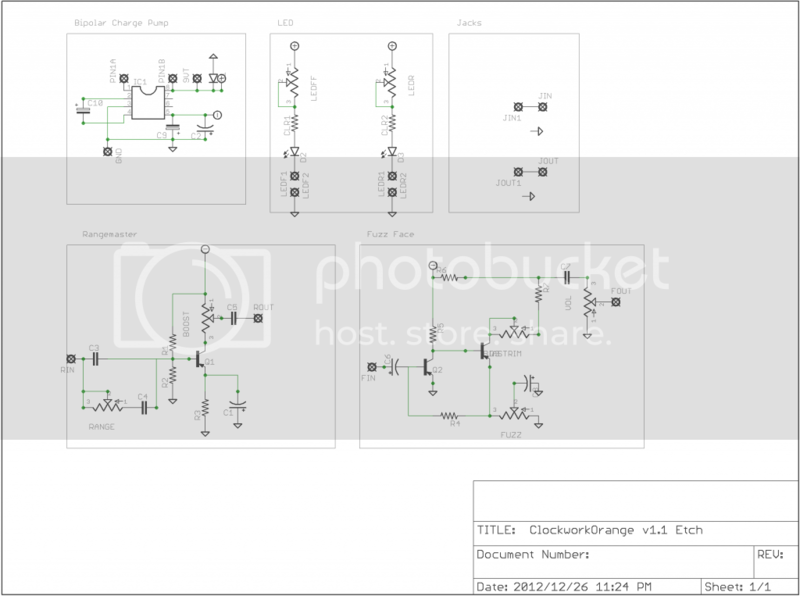 A mix of silicon and germanium transistors? Would a germanium optimized circuit sound good if a silicon was switched in? Oh goodness, where does it end? You are definitely right about the rev log pot - the useful bits really bunch up at the end of the lin pot. Perhaps the lin was just used because different tapers may have been difficult to manufacture at the time? That's why PNP was first used - NPN was apparently tough to manufacture consistently. Even with daisy chaining, the charge pump ain't necessary to me. If you run the circuit 'upside down', it sees the +9v as its ground, and the ground is 'negative' in relation for the collector. I've found the battery sounds better, battery dying simulation or not, but i'm really splitting hairs here. Difference between germs in same circuit......yes vast. Do a switcher later. Even Eric Johnson's cheapy BC183C's if biased right sound decent. Also 2n2222. 2n3904 can sound harsh in standard fuzzface. BC108's,(and 7,9) sound brilliant. All about the bias on the second transistor. Playing with bias on first is only really noticable when guitar volume is down....so its about the 'clean up' nature. Ya if you run the PNP transistors with a negative ground, it does run the risk of oscillation. From what I've read and experienced it sometimes happens and sometimes doesn't. When I tried running my PNP transistors with negative ground they would randomly oscillate, especially when playing with things like the voltage. Then again, as I understand it, that's exactly how the Zvex Fuzz Factory works. Ie Mr Vex uses the oscillation to his advantage. The 1044/7660 charge pump is 1 chip and 2 capacitors so even if it's just a precaution, the low parts count helps it rank higher on the cost vs benefit side. Thanks for the advice regarding the transistors! So far the only PNP ones I have are the AC128's. Might need to acquire more! Oh what I meant was the switch would switch between 2 options for the second transistor. But each option would have it's own bias trimmer so you wouldn't need to rebias it every time. Found a link to illustrate want I'm trying to say. I've been able to mix PNP and NPN. With no problems. psyx wrote: Having the PCB is one thing... Having the Germanium transistors is a whole different thing. I'm glad you suggested this because I've been wanting to find out who in South Africa stocks these things. I haven't been able to find any.